July has been an exciting month! We have just returned from Colombia, South America where we were planting a church. While I conducted evangelistic meetings for the adults, my daughter Hannah and her friend Hannah White conducted children’s evangelism. 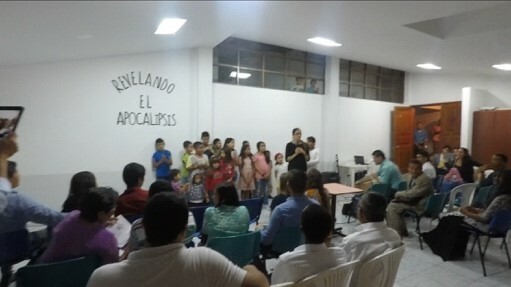 Our campaign took place in Buenavista, a town that has never had any Adventist church. Several times, others have attempted to establish a church there, but without success. Buenavista is a small Catholic town nestled at the foot of the Andes Mountains, with a population of around 2,000 people. I knew this was going to be a very difficult town to evangelize since everyone knows one another and the influence of the Catholic priest is very strong. When I learned that the priest was making announcements and visiting his parishioners to warn them not to attend the meetings, this passage flashed into my mind: “The solemn, sacred message of warning must be proclaimed in the most difficult fields and in the most sinful cities, in every place where the light of the great threefold gospel message has not yet dawned. Everyone is to hear the last call to the marriage supper of the Lamb. From town to town, from city to city, from country to country, the message of present truth is to be proclaimed, not with outward display, but in the power of the Spirit.” Gospel Workers, 27. Claiming this promise, we pressed on in the battle with darkness. On the opening night of the seminar, we presented the great controversy and the war in Heaven. Shortly after we began the message, the enemy of souls sent an entourage down our street with sirens blasting and drums beating. 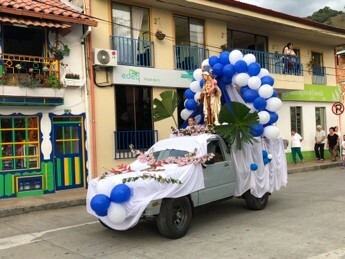 The priest had organized a parade to venerate the Virgin Mary. Escorted by the police, hundreds of townspeople marched down the street with a statue of the Virgin leading the way. The parade was so loud that we had to pause the meetings until it passed. This encouraged us to pray more that God would break the power of superstition upon the people and let the captives go free. The next night, more people joined us in studying the image and the rock of Daniel 2! Several months prior to the meetings, two Bible workers had begun the groundwork in Buenavista. They did an excellent job starting Bible studies with many people and preparing the heart’s soil to receive the seed of truth. As the meetings progressed, I could see conviction taking hold upon many minds. Some took notes, others listened intently to the Word of God and some asked questions after the meetings. I heard people say out loud, “What a blessing to come where the Bible is taught.” The night we studied “Mystery Babylon” and made the call to come out of Babylon, almost the entire room stood to show their decision to come out of the fallen churches and false doctrines. I could see that God was wrestling with each mind. 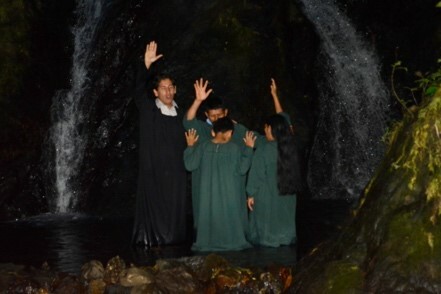 Later, many responded to the call to join God’s remnant church through baptism. Wawa and her husband Jorge, who had attended every night, were among those who came forward and made the commitment to be baptized into the body of Christ. They had come out of Catholicism and tried the Pentecostal religion, but found it be empty and void of the true gospel. Jorge had been an alcoholic but found deliverance in Christ about a year ago through the prayers of his wife. Among those who were not yet ready for baptism, several kept the Sabbath with us for the first time and joined us for the baptism late that evening. The Bible workers will continue working with the meeting attendees and with the townspeople. Pray that God will work on the people’s hearts as they attend church each Sabbath. Pray that they will make their decisions to go all the way with the Lord. Pray that many more souls will come to the truth!